Here is a vector-based PDF version or the Madinah Mushaf, meaning that it can be zoomed in without it becoming blurry. This is the version shown in the screenshots above. The text is vector based, but the arabesque (decorations) are non-vector, thus when zoomed in they become blurry. 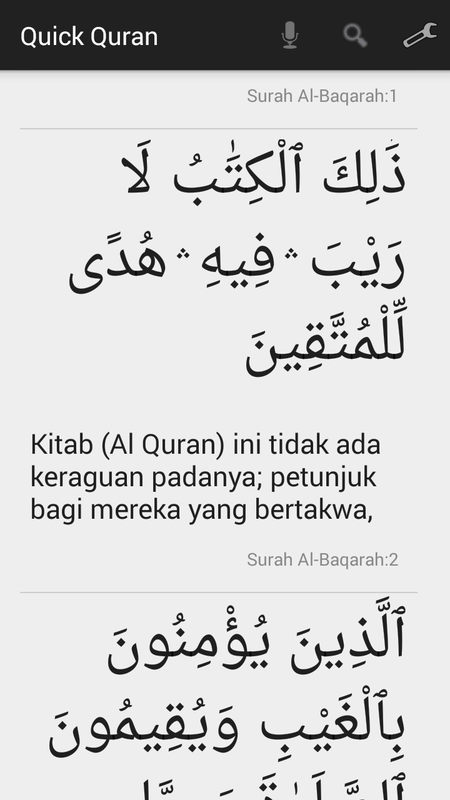 I like this one because this mushaf is the one I've been used to reading all my life. The new one below is a different one, with different calligraphy and verse arrangements. These PDF Mushaf files and this last screenshot were found on this [Arabic] website http://quranmadina.blogspot.com/. The file linked above is Dr. Muhammad Muhsin Khan and Dr. Muhammad Taqiyuddeen al-Hilali's translation of the Quran, the Noble Quran, for the Kindle. It has a working table of contents which helps greatly with browsing chapters. Thanks to Abdullah Hashim of SayfSolutions.com for providing the file. This file should also work on any device supported by the Mobipocket reader or one of the Kindle applications. For those who own Kindle devices and wish to read the Quran on it, here is a version that has worked well for me. I made the fonts big for better viewing, as you can see in the screenshot below [taken using alt+shift+g on the Kindle]. The size of the file is only 2 megabytes, therefore it should be pretty easy to save it and email it to the device. Arabic Quran for the Kindle [Ebook - PDF]. The file should work on the device without hassle. If you choose to email the file to your Kindle rather than transferring it directly from your computer, do NOT add the 'convert' statement to your email subject line. The file has to be transferred without conversion. 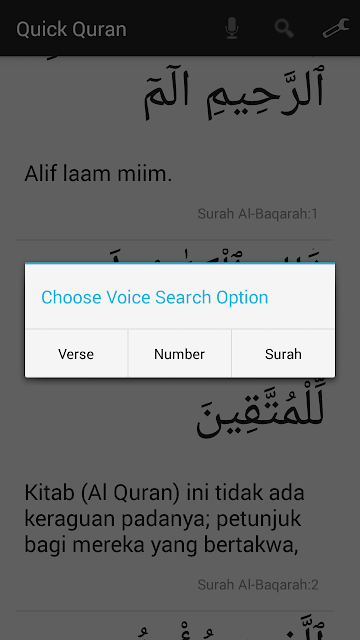 The Arabic text comes from Harf Information Technology, a Quran software company. The text has been verified and approved by Azhar University. There is a note [in Arabic] at the end of the PDF file regarding the file's origins and its verification process. 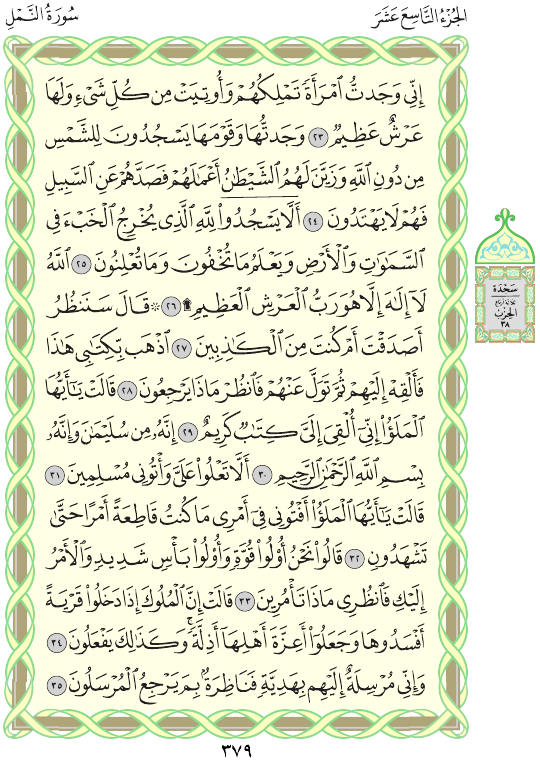 If you'd like to read a version that looks more like an ordinary mushaf [pictured above], you can download the following version, taken from qurandownload.com. Please note that I haven't verified that authenticity of this version. Arabic Quran - Original format [Ebook - PDF]. You can choose to view it in landscape format to get bigger text. You may also try out the Kindle Quran versions at Quran Ebooks. I haven't personally verified their content, please feel free to share what you think of them in the comments. Also check out Quran E-library which seems to have a large collection of Kindle-formatted versions of the Quran. Recently I read a study that correlates sleeping problems with using computers at night. Apparently the light from computer screens trick our brains to think it is still daytime, and this prevents us from feeling sleepy. For this reason I decided to adjust my computer's screen brightness according to the time of day (bright during the day, less bright at night). I soon found two programs that helped me with this goal, and I'll list them here so that others can benefit from them. The first one is a free program called F.lux. When the sun sets, the program changes your computer's "color temperature" to a temperature that is more comfortable on the eyes. You'll need to give it your location so that it knows the time of sunset for you. 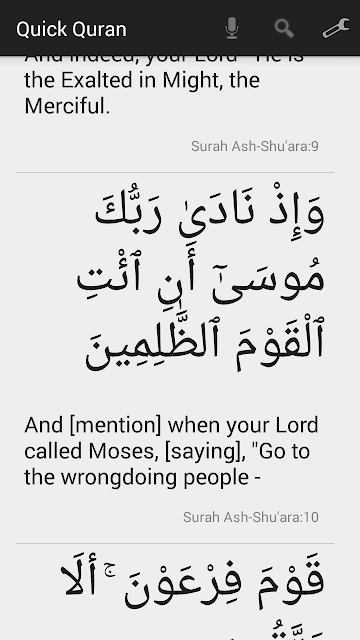 It also serves as a reminder for the magrib prayer. :) When the color changes, you know it is time to pray. The second program is also free and it is called MonitorBright. I found that f.lux helps but my monitor still stayed a little too bright. Therefore I now use this program to decrease brightness. Once you download it and open it, right click on its taskbar icon and enter a percentage (such as 20%). The bigger the percentage, the darker your screen will become. The goal here is to make your monitor's brightness the same as the brightness of the room. Making the monitor too dark compared to the room's brightness will probably hurt your eyes. I have already expressed my love for this tafseer in the past. Since I use it a lot I have worked on it some more to make it look better. I have also cleaned up the extra white space between the lines. I have made two versions of the tafseer. They are identical, however, the Microsoft Word version is easier to search, while the Adobe PDF version looks better and is easier to read. 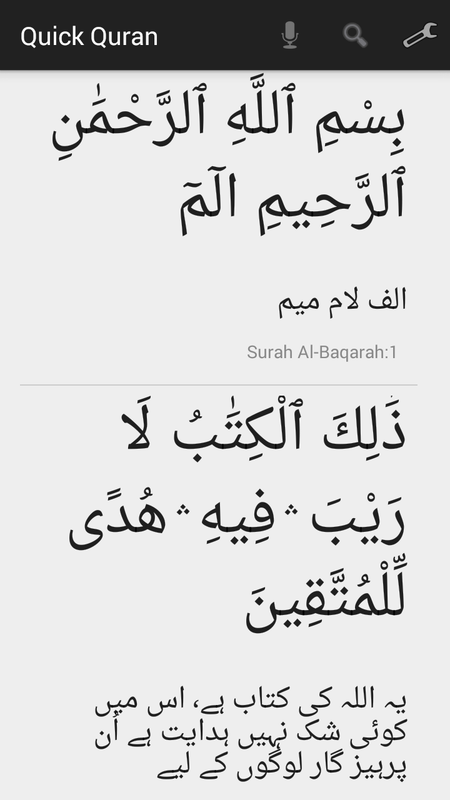 This is my favorite recitation of Suratul Kahf. Enjoy listening to it. It is great for memorizing the surah, as he gives every verse its own character with his rich voice and different tones. If you go to the page linked above, you'll see a "Play" button that you can use to listen to the recitation without downloading it. Another one of Sheikh Abdul Basit Abdus Samad's best recitations. "Sheikh 'Abdul-Bâsit 'Abdus-Samad was born in 1927 and died in 1988. He came to Cairo from the city of Armant in Upper Egypt in 1950, having established his reputation in the south. He was the first reciter in his family, but his grandfather was a religious scholar of al-Azhar training. Sheikh 'Abdul-Bâsit is probably the best-known of Egyptian reciters outside of Egypt, as he was the first to make commercial recordings of his recitation, and he has travelled extensively outside of Egypt. Sheikh 'Abdul-Bâsit is one of the four top-ranking reciters in Egypt. He was the first president of the newly formed Reciters' Union. Sheikh 'Abdul-Bâsit is admired for breath control and his high-pitched, clear voice. Three recordings of the entire Qur'ân by Sheikh 'Abdul-Bâsit are available: two in the transmission of Hafs (one murattal and one mujawwad) and one in the transmission of Warsh 'an Nafi'." Sheikh Abdul Basit recitations available on QuranClub for download: Surah Ad-Dhuha and Al-Inshirah - Surah At-Tariq. This biography was taken from this page. This is another one of Sheikh Abdul Basit's best Quran recitations. This is one of Sheikh Abdul Basit's best recitations. Download it if you don't have it. T. B. Irving (1914–2002) was an American Muslim author, professor, and scholar. He wrote the first American English translation of the Quran. Mr. Irving has translated the meaning of the Quran, instead of translating each verse word for word. He also uses modern American English. The result of his efforts is the Koran, The First American Translation. This book is easy and fun to read, unlike some other translations. More about T. B. Irving on SoundVision. 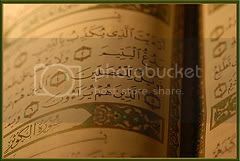 The Noble Quran is clear and concise, with explanations separated from the main text by brackets. In some places where a verse has multiple valid interpretations they have only stated one, probably to avoid confusing the readers. You might get the wrong idea about certain verses if you depend exclusively on any one translation of the Quran. You should read as many translations as you can. And learn Arabic. 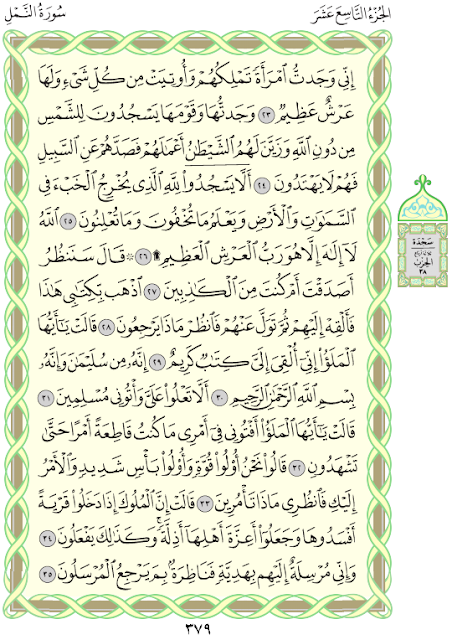 This tafseer of the Quran is used by the majority of people living in northern Iraq. It is simple and easy to understand. It is written in the Sorani, or Kirmanji Khwaroo, dialect. Download here: Kurdish Asan Tafseer. This is an Arabic Quran in Microsoft Word (doc) format. It has been extracted from the seventh version of HARF IT Co.'s Arabic Quran program. The text has been legally reviewed and approved by the Azhar Islamic university in Cairo (according to the program's website). Microsoft Word's search capability is great in that whether you search for يتيم or يَتِيمْ, i.e. whether you put harakat or not, it will find your search term. However, when you use harakat, it will only find words that have the same exact ones. If you search for غّ (Ghayn with a shaddah), it won't find anything since that combination doesn't exist in the Quran. The document has a table of contents at the beginning that you can use by holding Ctrl and clicking on the chapter you want. Have you ever seen a beautiful PDF file and wished you could use its fonts? I have. This evening I spent more than an hour trying to find a way to extract a font from an absolutely beautiful Arabic book (it used a variant of Microsoft's Traditional Arabic font). Google, like usual, was useless for this type of rare endeavor. But thanks to God, I remembered a software company known as Process Text Group who specialize in text software. I went to their website. Sadly there was no mention of a PDF font extractor. 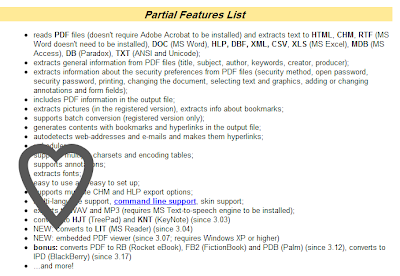 However, I looked at the details page for their PDF converter, and Alhamdulillah! It said it could extract fonts. You can download the program from this page. It is a trial version, but functional nonetheless. Go to View-->Fonts to view and save the fonts you want. So I've been reading (and there is always room for improvement of course) in an Arabic & English Quran since I last posted. I've compiled a list of some of the ones I noticed and liked while reading. I tried to narrow their location down as best as I could (but I don't have the Quran in front of me now). Raadhi: Someone who is content, for boys. In conclusion, most of the Quranic names can be found in the last Juz. Probably because the last juz talks about heaven a lot (and punishment a lot too). The most unique names come from this part of the Quran, in my opinion. It would be cool to name your daughter after a fountain in jannah -- How awesome!-- and most others will not have that name since it's rare. I'd love it if others could add to the list. I'd like to compile a long list of names some day and pass them out to friends that are pregnant.